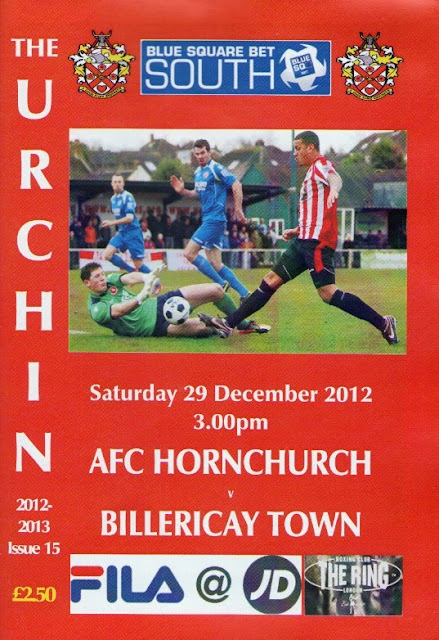 For my 101st and final game of 2012, I had decided to go to Hornchurch. It would be my 51st new ground for a game in 2012, a lot more than I'd thought I'd done. The costs were mounting up - over £1000 now for the 63 games that I have seen this season - that's including entry, travel, food, drink and anything spent on programmes and in the club shop. Plus the costs of a hotel where I stayed overnight on a couple of occasions, thus saving on fuel. I'd certainly enjoyed it, visiting some great new places, seeing some good games and drinking in some excellent pubs. Maybe I will do a 2012 awards for a few categories in a separate post if I get the time. But most of all I have enjoyed meeting several great people, football really would be a lot duller without company and as well as going to games with people I have known for years, I have met some fantastic new people through Facebook and the like. So despite the hefty outlay in time and money, I'd still say it was worth it. 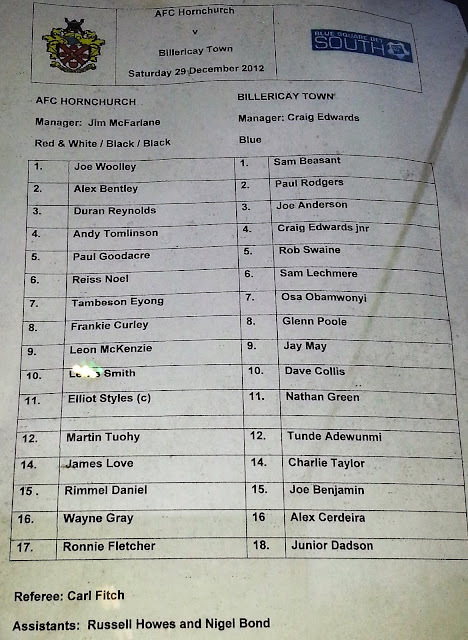 I hadn't really been looking forward to Hornchurch to be honest, and I would be on my own for once. I had planned to go to a game with someone, but as more and more games bit the dust, my options became severely limited and so I went for one that was confirmed as on, Hornchurch ticked the box and there was also the Ryman Division 1 North game between Heybridge Swifts and Redbridge, should I need a backup. The reason for my reluctance to go to Hornchurch was because of a running track around the pitch. I've had plenty of dreadful views in this situation, most notably at Brighton and Rotherham's old grounds, which really spoilt the day for me. On a positive note, I now only have Truro City and Weston Super-Mare to visit for a game in the Conference South. Under most circumstances, I would be looking to complete both as soon as possible. Weston Super-Mare would be a long journey, around 3 hours but Truro would be double that. So maybe I will hold off completing this league until next season, secretly hoping that Truro's form does not pick up and that they are out of this league by next season. Or more ideally that Wycombe gets a cup game down there, as I would never wish ill on any club apart from the MK Franchise. On the day we had family around, which was my main reason for staying fairly local - Wycombe were playing at Plymouth and that was miles away and I needed to get back. I left home just after 1PM, checking Twitter every time I stopped at traffic lights, convinced that the latest band of rain would screw up my plans. And as soon as I got anywhere near Essex, I tuned into the local BBC radio station so I could keep up to date with any news on the game. Thankfully all was OK and the game went ahead as planned. I got to Hornchurch around 2.25 and with the last takeaway or shop I saw being about half a mile away, I decided to go straight in. The club car park was full, but luckily there was plenty of street parking and I found myself a good spot. I made the short walk down to the ground, paying £7 to get in and £2.50 for a programme. I was quite hungry by this time and so I got myself a portion of chips for £2, and later on at halftime, a Bovril as it was getting a bit chilly by then. 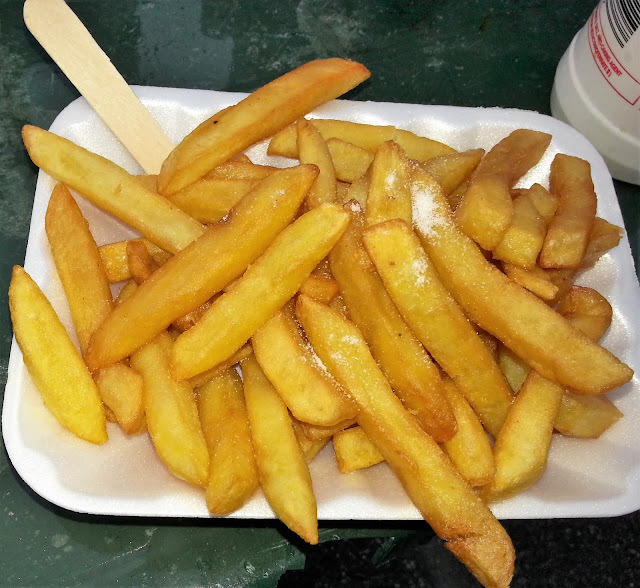 I saw signs for the club shop and so after finishing my chips, I made my way in and had a good look. There was a good selection of programmes, including lots of foreign ones from Germany and Spain. Also some books, as well as the usual range of stuff that you get in shops nowadays. Sadly no pennants though, so I wasn't able to add to my collection, but seeing as there is precious little space on my wall, it was probably a blessing in disguise. After taking some pictures of the ground it was time for kick off and so I found a place on the terrace and settled down for the game. The game wasn't the best. As per many local derbies, it was cagey with neither side wanting to give much away. But in the end, Hornchurch were good for the win, and deservedly got it, winning 1-0. 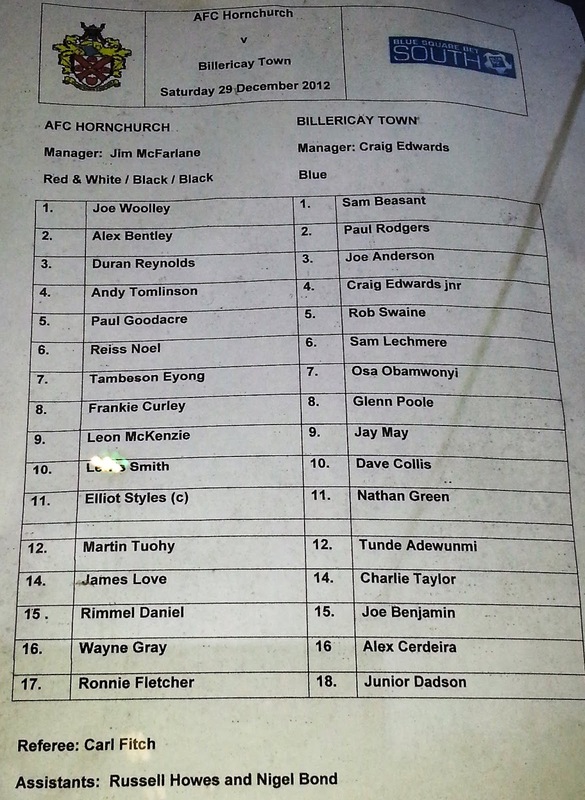 Billericay were a different side to the attacking and adventurous side that I had seen play Tonbridge Angels back in September at their own ground. 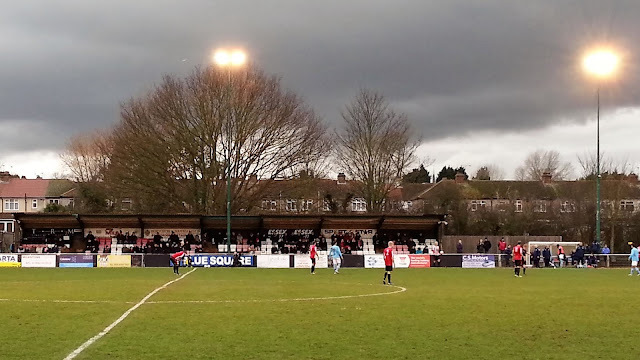 An attendance of 503 witnessed Tambeson Eyong gave Hornchurch the lead in the 29th minute, firing into the net from outside the area. It was well deserved asthey hadd the best of what chances there were. And that continued into the second half. To compound Billericay's misery, they had a man sent off on 78 minutes when Joe Benjamin got his tackle on goalscorer Eyong all wrong and was given the red card. Amazingly he had only been on the pitch a minute, having come on a substitute just before the tackle. After around 7 minutes of injury time, it was time to leave, and thankfully it was as easy a trip home as it was there. I was astonished to hear the score of one game, Heybridge beating Redbridge by a massive score of 11-0. And I nearly went to it. 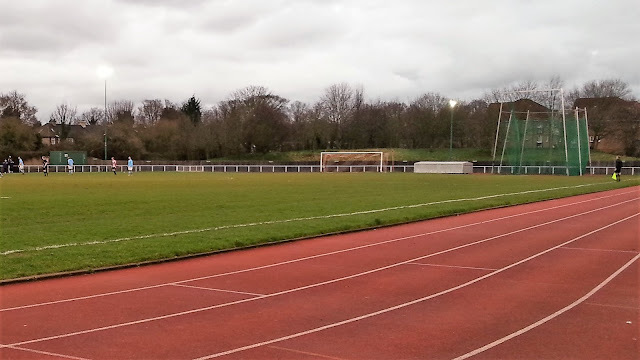 The most number of goals I have seen in a game is 9 - most recently Woodford United's 5-4 defeat to Leighton Town, so that would have been a new record. After Wednesday, I was a bit more careful driving past the speed camera that went off - and this time, the dirty flasher was dormant. I got back in about 6.30, and spent the rest of my night catching up with family, drinking and playing Trivial Pursuit, before watching Match Of The Day. 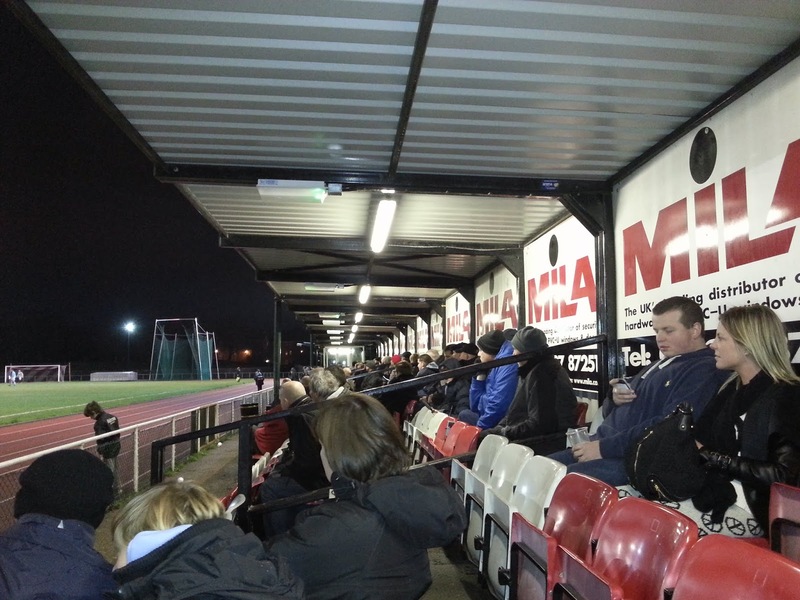 HORNCHURCH STADIUM was not as bad as I first thought it would be. Despite having a running track around it, it's as narrow as they could possibly make it, so from the sides, the view is not bad. Along the sides are mainly metal arena type stands, though there is some terracing too, some covered and some uncovered. It's behind the goals that are the problem, just a narrow path to stand on and it's miles from the action. Although it's not as bad as I first thought, I still think it would need a lot of improvements to be accepted into the Blue Square Premier. 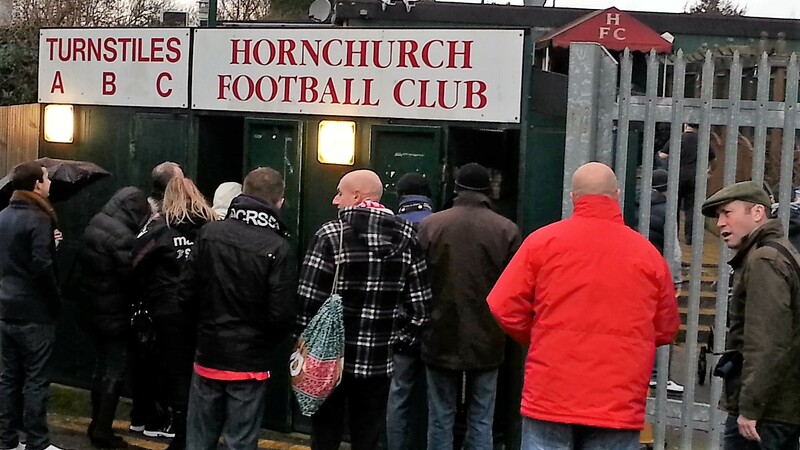 I had been to the ground before, before Hornchurch had financial issues and reformed as AFC Hornchurch and it hasn't changed much since then. The other facilities are a bit better, there is a nice spacious bar, which although offering nothing special in the drinks stakes is warm and comfortable and it has Sky TV too. And although the tea bar costs a bit more price wise than others in this league, the food is nice. 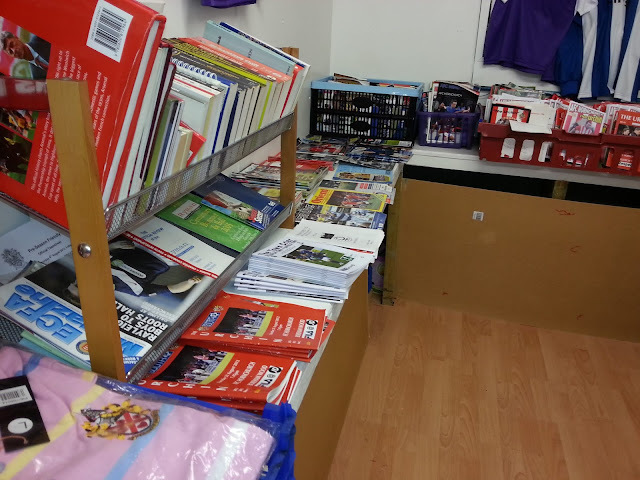 And as mentioned before, the club shop has a good selection of rare and foreign programmes, and although there was nothing I fancied, it's certainly worth a look.